Color blocking is all the rage now in the fashion runway and it looks like it’s here to still early 2013. I’ve recently tried it on my wardrobe so I thought I might share this trend with all you brides-to-be(s) too! Color blocking is a technique where blocks of various fabrics are sewn together to create clothing with a few different solid colors..
I’ve read somewhere that color blocking is not for the faint of heart. 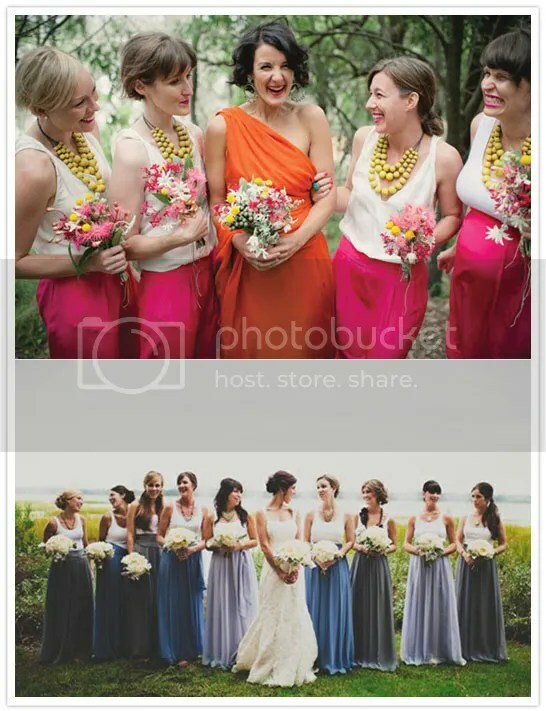 So if you think having a color blocked wedding dress is too much, you can always channel this colorful trend with your bridesmaids dresses. The key colors this year is fuschia & tangerine, black on yellow, blue (which is now the winter color here in Australia) or neon colors. I’m so in love with the canopy ceiling. Love the colors! 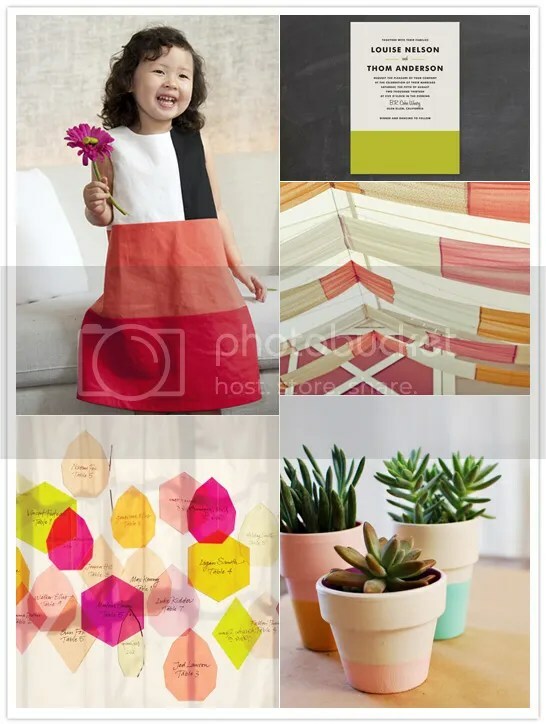 For favors, I found these adorable DIY terra cotta pots. Who can forget the cake! So, will you be color-blocking your wedding too? If yes, which color will you be mixing together? I’m back from the down under and just want to post a little some’in to cheer up this gloomy Thursday. 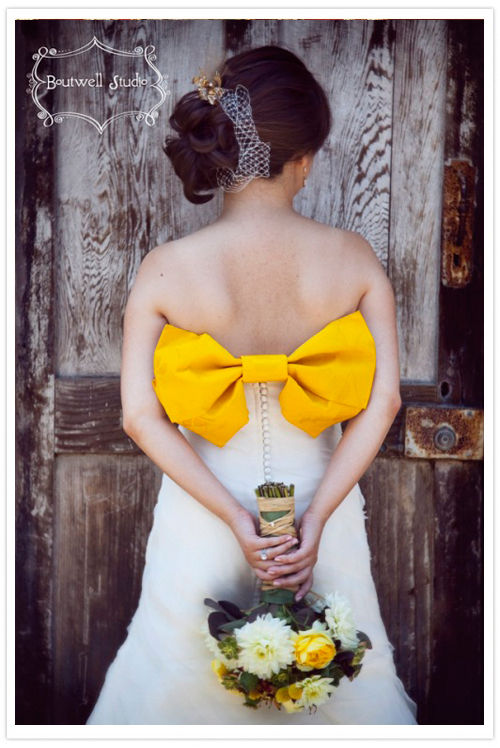 A big bright yellow Japanese obi (tied as a bow) at the back…lovely! Yes, we ain’t done with summer colors…here’s more coverage from our pink, orange & yellow wedding. See the white lantern in the bride & groom’s table? Such a good find from the flea market! Just add a little white paint for a more polished look. Today’s post is just in time for spring! It’s a bit overdue but it’s still deliciously colorful! 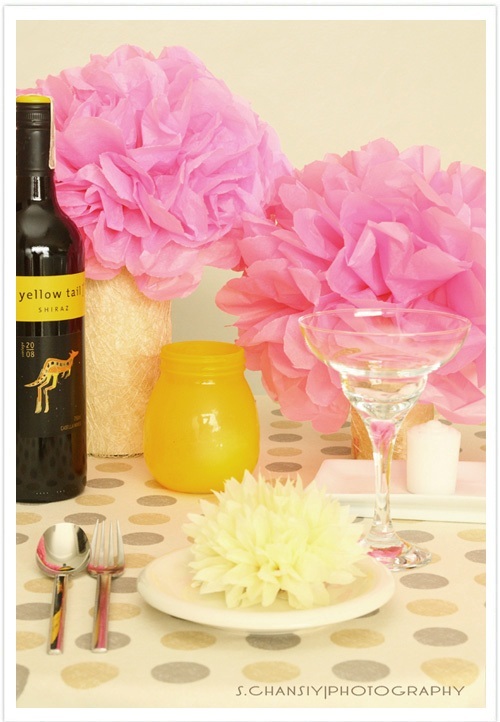 Remember this pink, yellow & orange tablescape we were going to use for a wedding? Here’s how the whole DIY reception setup turned out. 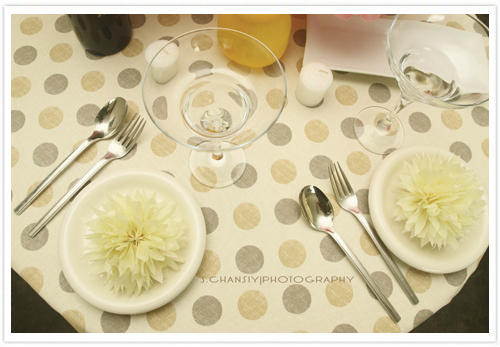 Those who know me knows that I love the simplicity & elegance of paper pompoms…plus it’s budget friendly! 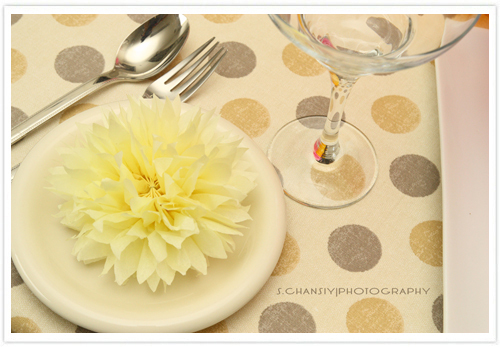 Mini paper pompoms for napkin rings & large paper pompoms as centerpieces…lovely! The pompom vases are actually recycled jars & bottles. We wrapped the jars with cream paper board as base then with gold mesh wrapping paper (found from Divisoria – good find!). Just to add to the color scheme, this candy bar was a sweet welcome as the guests arrived. Seriously. Who doesn’t love DIY. This is such an exciting post! Finally, it’s R&B’s first ever tablescape! 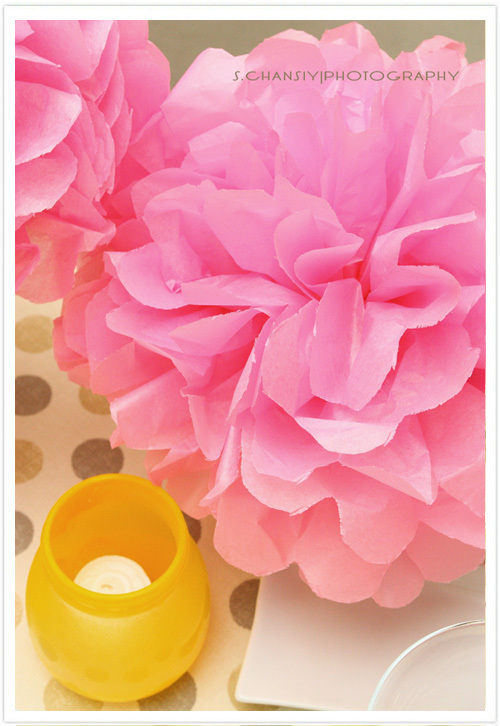 Remember, the DIY ruffled bouquet & the pink, orange & yellow wedding I’ve mentioned before? 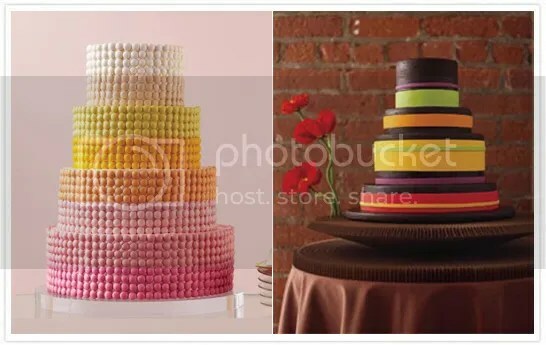 Well, here’s how it would like all put together for a whimsical gleeful wedding. Can’t wait for more projects to come! Happy weekend everyone! Finally, after months & months, I was able to buy some time to create a new color board. Yehey! Colors! The trend now is to just go crazy with palettes and go gaga with creativity! Left to right: Wedding cake from 100LayerCake, ruffled gown by The White Dress by The Shore, candy buffetphoto by Rebekah Westover Photography, groom’s tan suit with orange tie from WeddingChicks & pink & orange parasols photo by Katie Day Photo. On another note, I’m so happy to share that R&B will be part of a pink, yellow & orange nuptial soon! Have a colorful day girlies!